StarTech.com® 15' Black DVI-I dual link cable effectively routes video signal from video source to a high-resolution DVI monitor. Supports 2560 x 1600 resolution video signal. StarTech.com® DVI-I Dual link cable in black color connects video source with the high-resolution DVI monitors. The 15' cable supports both analog and digital displays. Carries digital video signals at a rate of 9.9 Gb/s for high speed transmission. Ferrite core with aluminum-mylar foil and braid shielding on 28 AWG conductors secure data from electromagnetic and radio frequency interference. 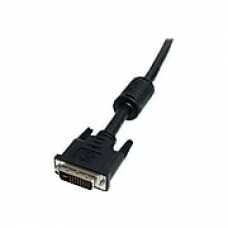 DVI-I male-to-male connector of the cable offers reliable connection without any data loss. Molded design of the connectors prevents damages such as wear and tear during installation. Hot-pluggable feature of the cable enables it to quickly connect or disconnect DVI display devices.